Not only did Oracle schedule this briefing on Canada Day, the biggest holiday in Canada, but they forced me to download the Real Player plug-in in order to participate. The good part, however, is that it was full streaming audio and video alongside the slides. Charles Phillips, Oracle President, kicked off with a welcome and some background on Oracle, including their focus on database, middleware and applications, and how middleware is the fastest-growing of these three product pillars. He described how Oracle Fusion middleware is used both by their own applications as well as ISVs and customers implementing their own SOA initiatives. He outlined their rationale for acquiring BEA: complementary products and architecture, internal expertise, strategic markets such as Asia, and the partner and channel ecosystem. He stated that they will continue to support BEA products under the existing support lifetimes, with no forced migration policies to move off of BEA platforms. They now consider themselves #1 in the middleware market in terms of both size and technology leadership, and Phillips gave a gentle slam to IBM for over-inflating their middleware market size by including everything but the kitchen sink in what they consider to be middleware. The BEA developer and architect online communities will be merged into the Oracle Technology Network: Dev2Dev will be merged into the Oracle Java Developer community, and Arch2Arch will be broadened to the Oracle community. Retaining all the BEA development centers, they now have 4,500 middleware developers; most BEA sales, consulting and support staff were also retained and integrated into the the Fusion middleware teams. Next up was Thomas Kurian, SVP of Product Development for Fusion Middleware and BEA product directions, with a more detailed view of the Oracle middleware products and strategy. Their basic philosophy for middleware is that it’s a unified suite rather than a collection of disjoint products, it’s modular from a purchasing and deployment standpoint, and it’s standards-based and open. He started to talk about applications enabled by their products, unifying SOA, process management, business intelligence, content management and Enterprise 2.0. For the “continue and converge” category, that is, of course, a bit different than “no forced migration”, but this is to be expected. My issue is with the overlap between the “strategic” category, which can include a convergence of an Oracle and a BEA product, and the “continue and converge” category, which includes products that will be converged into another product: when is a converged product considered “strategic” rather than “continue and converge”, or is this just the spin they’re putting on things so as to not freak out BEA customers who have put huge investments into a BEA product that is going to be converged into an existing Oracle product? 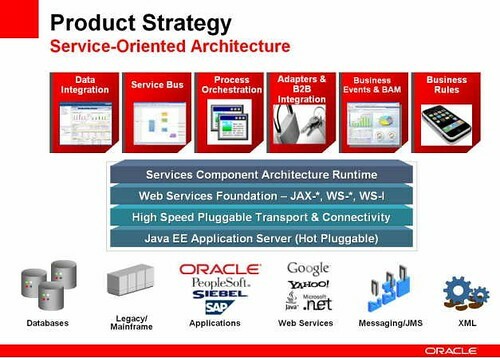 Note that the Oracle Service Bus is in the “strategic” category, but is a convergence of AL-SB and Oracle ESB, which means that customers of one of those two products (or maybe both) are not going to be happy. 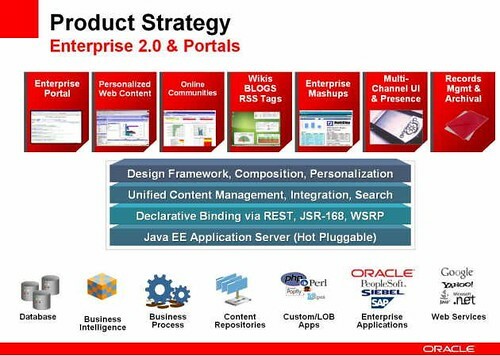 Kurian discussed the implications of this product strategy on Oracle Applications customers: much of this will be transparent to Oracle Applications, since many of these products form the framework on which the applications are built, but are isolated so that customizations don’t touch them. For those changes that will impact the applications, they’ll be introduced gradually. 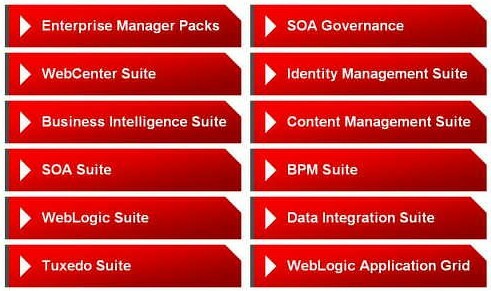 Of course, some Oracle Apps are already certified with BEA products that are now designated as strategic Oracle products. The entire briefing will be available soon for replay on Oracle’s website if you’re interested in seeing the full hour and 45 minutes. There’s more information about the middleware products here, and you can sign up to attend an Oracle BEA welcome event in your city. From my perspective, overall the story makes as much sense as it probably could, but the BPM area is probably the most messy. 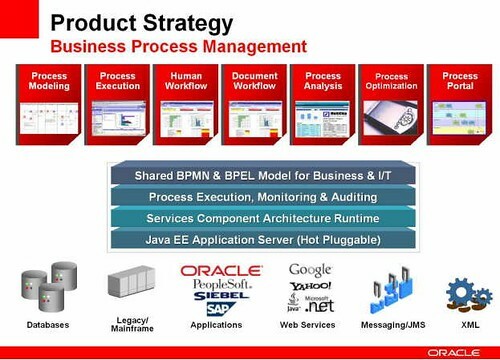 Creating one converged runtime for the Oracle and BEA BPM technology stacks is going to take some time. Thanks for your comment, Neil, and I agree on the messiness of the BPM side — bringing together the Oracle BPEL PM and AL-BPM engines without breaking them both is going to present some challenges. This is a great post. If Oracle is able to bring this to life, it could easily be the best SOA stack moving forward. However we still have sometime before this strategy sees sunshine. In my post, I have tried to analyze some of the changes in SOA stack. Well, my understanding of Oracle direction with Weblogic Portal is a bit different though Thomas Kurian was somewhat vague on the topic. The way I heard it is that Weblogic Portal will be supported and customers may even take advantage of some WebCenter capabilities without migration. Some of WebCenter components as well as Aqualogic UI components will be integrated into WebCenter framework. Oracle did not clearly stated that Weblogic Portal is “continue & converge” product but you can kind of derive it from the context. As far as Oracle Portal goes it was hardly mentioned. It looks like it is a maintenance product. It was clearly stated: both WebLogic Portal and AL-UI were shown on the slide as “continue & converge”. I didn’t get to see the slide my connection was timing out 🙂 So my statement was based on what I heard Thomas Kurian was saying. I guess it doesn’t make that much of a difference – “continue & converge” to me looks no more then a marketing spin anyway. Pure marketing! hot-pluggable? hmm not really. all JCA connectors said Oracle, are actually iWay software. Oracle software already supports BEA middleware, yes! BUUT the old version 8 of WebLogic. A nice mise en scene to hide all the crap they will do in 2 years time to integrate all this. I did not see where the app server (being the platform for all the mentioned components) is headed to. Will weblogic server replace Oracle app server as underlying app container? Andrei, I added all the product roadmap slides here, in case you don’t want to bother going through the replay. Krish, there’s a slide in that set on the app server roadmap; I didn’t comment on that since that’s not my area of interest, but BEA WebLogic Server is labelled as “strategic” while Oracle App Server is “continue & converge”, stating that the OAS key features will be integrated into the WebLogic Server. Erik, I agree that a lot of these are incompatible, such that the idea of convergence is pure nonsense. I predict a lot of unhappy Oracle and BEA customers over the next couple of years as Oracle re-jigs all of this. What is happening to Aqualogic Data Service Platform? Many Enterprise Portals are very critical to the company. How will they migrate to WebCenter 2.0?